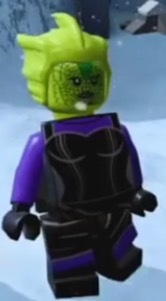 Madame Vastra is a minifigure who appears in LEGO Dimensions. She is a Silurian who are normally enemies of The Doctor. She is master swordsman and is member of the Paternoster gang along with her Sontaran friend Strax and her Human housemaid, Jenny. She normally works for Scotland Yard in 18th century London and is a detective working for Scotland Yard. She is a friend of The Doctor and Clara Oswald. This page was last edited on 12 January 2016, at 23:23.